When you’re playing campanella picking on ukulele you’re trying to avoid playing two notes sequentially on the same string where possible. The result of this is notes that ring together. It’s a beautiful sound and makes for some interesting finger positioning (which comes with the added advantage of helping you learn the fretboard at the same time). Enough waffling on about what campanella actually is, how about we learn a song? I’ve picked a nice simple one to begin with – London Bridge Is Falling Down. It’s a simple song with a simple melody that illustrates campanella really well. We’re making a lot of use of open strings here. You actually only need to fret 2 notes to play through the whole song. The F note (on the 5th fret of the C string) and the D (also on the C string, this time at the 2nd fret). You should notice that this feels and sounds quite a lot different to the melodies that you normally play. If you’d like some help on this one it’s worth watching this video from the really rather talented Jonathan Lewis where he plays through the tab. 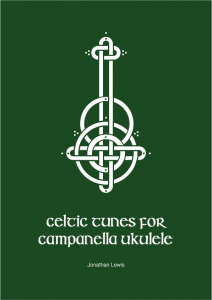 If Campanella seems like your kind of thing then I’d recommend taking a look at Jonathan Lewis’s brilliant ebook: Celtic Tunes For Campanella Ukulele. There are 40 fantastic arrangements for ukulele in the campanella picking style. Every arrangement has a supporting Youtube video and MP3 file. At just $19 it’s a great deal. You can get more information on the ebook using the link below. Love it. Trying to figure out how to play it on my bariton uke! It´s wonderful. I love campanella style and I hope you share more lessons. Thank you very much!